The monsoon fun continues in India in July. A number of colorful religious festivals take place all over the country. Here's the pick of events in July in India (listed by date). It's mango season in India! Don't miss sampling the 500 varieties of mangoes on display at this popular, long-running annual two-day festival that celebrates the much-loved "king of fruits". No, 500 is not a typo! Apparently, there really are so many different varieties to try and buy, along with various mango products such as jam. A mango eating competition also provides entertainment. Contestants will attempt to consume three kilograms of mangoes in three minutes. Where: Dilli Haat in Janakpuri, Delhi. A free shuttle service is provided from Tilak Nagar Metro station to Dilli Haat. The famous Amarnath cave temple, one of the top caves in India, houses a Shiva lingam made out of ice. It's one of the toughest pilgrimages in India to visit it. Pilgrims must battle inclement weather, which makes the track slippery and dangerous, as well as very high altitude. When: July to August. Dates to be announced. Where: On Mount Amarnath, around 140 kilometers from Srinagar in Kashmir. There are two routes to the shrine -- 16 kilometers from Baltal in Ganderbal and the traditional 45 kilometers Pahalgam track in Anantnag district, approximately three to four hours drive from Srinagar. Dree is an agricultural festival of the Apatani tribe. It's celebrated by sacrificial offerings and prayers to the gods who protect the crops. Folk songs, traditional dances, and other cultural performances have also become a part of the modern-day festivities. There's even a "Mr Dree" contest, billed as the ultimate platform for men to show their strength, agility, stamina, and intelligence! When: July 4-7 each year. Where: Ziro, Arunachal Pradesh, Northeast India. The exuberant 12-day Rath Yatra festival sees Lord Jagannath (a reincarnation of Lords Vishnu and Krishna), along with and his elder brother Balabhadra and sister Subhadra, venture out of their abode in Puri's Jagannath Temple. The gods are transported on massive towering chariots. It's Odisha's most popular festival. Discover how the chariots are made. The process is fascinating. Where: Jagannath Temple, Puri, Odisha. Elephants are usually seen decorated and paraded around during temple festivals in Kerala. However, during this elephant feeding ritual, they remain unadorned. The elephants are taken inside the temple premises and given a delicious feast of sugarcane leaves, coconut, jaggery and other local produce by people who come to worship them. The ritual aims to please Lord Ganesh, for the removal of obstacles and fulfillment of wishes. Where: Njangattiri Bhagavathi temple, Pattambi, Palakkad district, Kerala. The most important festival of the Pnar tribe of Meghalaya, Beh Deinkhlam is celebrated after agricultural sowing is over. Khlam means plague and beh dien means to drive away with sticks. Hence, the festival is held to drive away and negative forces that may affect the crop. The festivities take place over three days, and culminate with procession of chariots and ceremonial tree trunks (khnongs) to a sacred pool full of water. Another highlight of the occasion is a football match between locals. The winner is believed to have a bumper harvest. Where: Jowai, Jaintia hills, Meghalaya, Northeast India. The Champakulam Boat Race is the oldest snake boat race of Kerala. It's also the first boat race of the season. A stunning procession is enacted prior to the race taking place. It features exotic water floats, boats decorated with colorful parasols, and performing artists. Read more about snake boat races in Kerala. Where: Pampa River at Champakulam, not far from Alleppey in Kerala. This full moon day is celebrated in remembrance of the ancient sage Vyasa, who edited and wrote a number of holy Hindu scriptures. However, the idea behind Guru Purnima extends further than that. It's also a day for giving thanks to anyone who's taught you spiritual lessons in life. Many people simply spend some time reviewing all the knowledge they've acquired in the last year, and the way it's helped transformed them. See these Top 6 Spiritual Destination in India. Where: All over India, particularly in spiritual centers such as Sivananda Ashram, Rishikesh. One of the largest Guru Purnima festivals is held at Goverdhan, near Mathura. 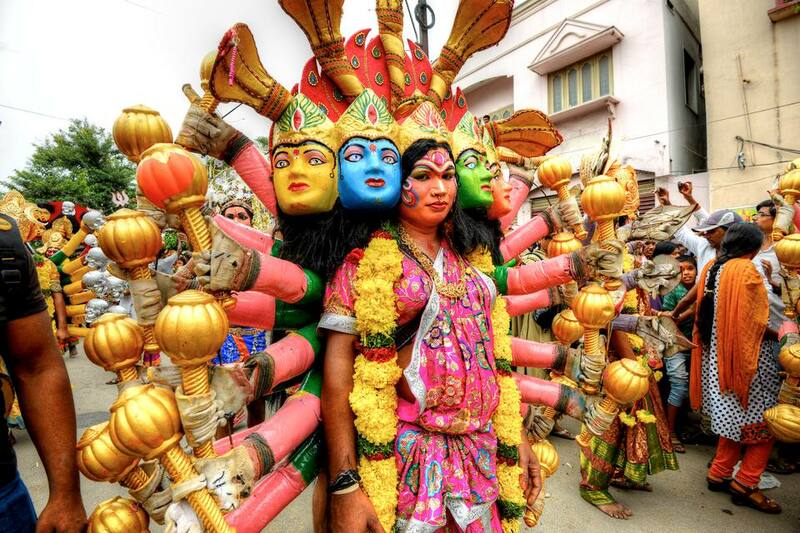 The 200+ year old Bonalu festival is a celebration of the Mother Goddess and Shakti (female energy). Rituals, dedicated to Goddess Mahakali, take place on Sundays during the Hindu month of Ashadha. Bonalu means feast in Telugu, and it signifies the offerings (rice cooked in milk and jaggery) presented to the goddess in return for fulfillment of vows. Women carry decorated clay pots on their heads to the temple. The festivities are first held at Mahakali Temple in Golconda Fort. The next main celebration is at Ujjaini Mahakali Temple in Secunderbad, with Rangam (predicting the future for the forthcoming year) and Ghatam (a procession of the goddess) the following day. The final (and biggest) event happens at Simhavahini Sri Mahakali Temple of Lal Darwza in the Old City of Hyderabad on the last Sunday. Rangam and Ghatam procession takes place the next day. When: July 7, July 14, July 21, and July 28. Bonalu at Ujjaini Mahakali Temple is July 21 and the Rangam is on July 22. Bonalu celebrations in the Old City are on July 28 and 29. Where: Secunderabad and Hyderabad, Telangana. Kerala Tourism launched this festival in 2018 with the aim of getting more people to visit the state during the monsoon season. It comprises renowned musicians from across India, plus a dance festival featuring mainstream and traditional music forms. Where: Nishagandhi Auditorium, Kanakakkunnu Palace Grounds, Trivandrum. The 15th edition of the Himalayan Odyssey will see motorcycle riders travel across some of the most challenging trails, on an epic journey through some of the highest mountain passes in India. A special women's edition of the festival is again being held this year, with about 30 women expected to participate. Where: From Delhi to Leh and then back via Spiti.